The Ireland boss labelled his Sunderland successor ‘a charlatan’ in Dublin this week. 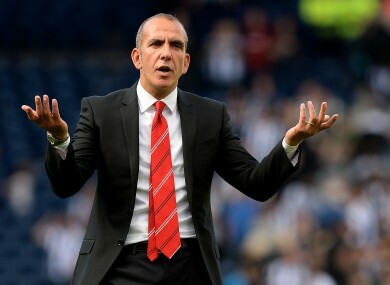 Paolo Di Canio replaced O'Neill at the Stadium of Light. O’Neill was unhappy with Di Canio’s conduct after the Italian replaced him at the Stadium of Light in March. However, O’Neill’s criticism of Di Canio has prompted a furious response from the 45-year-old, who has questioned the former’s grasp of the English language. “I don’t know if he knows the meaning of this word charlatan. Probably I can teach him, even if I am not English,” Di Canio told Sky Sports News. “I respect the opinion of manager Martin O’Neill but the fact that he spoke after six months, not straight away – that proves what kind of level he is. He is not very big. Di Canio also stood by his previous criticism of player fitness when he arrived at Sunderland, while accusing Phil Bardsley of ‘treason’ after he mocked the club’s 1-0 opening-day loss to Fulham via social media. “I had players who told me they had cramps from driving the car,” Di Canio added. “I had three players with injuries in the calf after 20 minutes of a game. Six different players with problems means they were not fit. “At the beginning of the season, he (Bardsley) made tweets celebrating the defeat of the club that pay him. A person at the club came to me and said ‘we want to fine him’, and I agreed. Caption time: What are Roy and Robbie saying at Lansdowne Road this evening? Email “Paolo Di Canio hits back at Ireland boss Martin O'Neill, insisting 'he is not very big'”. Feedback on “Paolo Di Canio hits back at Ireland boss Martin O'Neill, insisting 'he is not very big'”.